Consult NFPA 105 for the latest coverage of smoke door assembly performance and major updates on provisions for smoke dampers. NFPA 105, Standard for Smoke Door Assemblies and Other Opening Protectives gives designers, engineers, installers, and contractors the most comprehensive requirements for the performance of required smoke door assemblies and other opening protectives, such as smoke dampers that are intended to limit the spread of smoke. 5.5 Prevention of Door Blockage. 5.6 Maintenance of Closing Mechanisms. 6.2 Swinging Doors with Fire Protection Ratings. 6.3 Swinging Doors Without Fire Protection Ratings. 6.4 Vision Panels in Doors. 6.5 Glazing in Sidelight and Transom Light Frames. 6.6 Side Panel and Transom Panel Frames. 7.6 Periodic Inspection and Testing. 8.2 Mounting of Smoke -Protective Curtain Assemblies. 8.6 Inspection, Testing, and Maintenance. 8.9 Periodic Inspection and Testing. 9.2 Mounting of Smoke-Protective Curtain Assemblies for Hoistways. 9.6 Inspection, Testing, and Maintenance. Trust the new 2016 NFPA 105 for state-of-the-art coverage of smoke door assembly performance. Smoke is the leading killer in destructive fires, and NFPA 105, Standard for the Installation of Smoke Door Assemblies and Other Opening Protectives gives designers, engineers, installers, and contractors the most comprehensive requirements for the performance of required smoke door assemblies and other opening protectives -- such as smoke dampers that are intended to limit the spread of smoke. 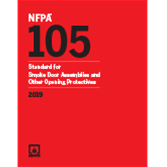 Reorganized for consistency with NFPA 80, Fire Doors and Other Opening Protectives, the 2016 NFPA 105 offers expanded coverage of multiple types of smoke door assemblies and other opening protectives. Revised and renumbered Chapter 5 provides expanded coverage of inspection, testing, and maintenance for different types of smoke doors and three types of testing; operational, acceptance, and periodic. New Chapter 6 presents the first door-specific installation criteria for swinging door assemblies, and new specific language addressing both fire-rated and non-fire-rated smoke door assemblies. Revised provisions for ITM of smoke dampers include new step-by-step provisions for testing and maintenance. New Chapter 8 provides new language on installation, inspection, testing, and maintenance of smoke protective curtain assemblies.